Board Game Store : EuroGames : Strategy Games : Puzzles : Off The Charts Games: A great line-up of games in this week! 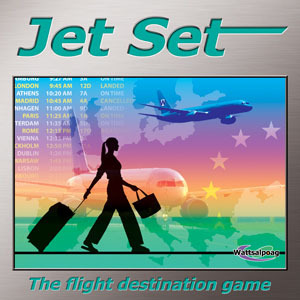 Jet Set - Can you run an International Airline? This economic game will make a world traveler out of you. Watch the video below. Last Call - Hey, Bartender make me a highball quick! Claim It! - Stake your claim. It's gold fever in this claim-jumping game. Pandemic - A cooperative game where the fate of humanity is in your hands! Tobago - The adventure begins when you assemble the modular board into one of 32 different scenarios. This is a fabulous family game and winner of the 2010 BoardGameGeek Golden Best Family Game. Quarriors! - The dice game of uber strategic hexahedron monster combat mayhem! Come in and find out more about this line up of Just In Games at Off The Charts Games. We are located in Historic downtown Gresham at 30 NW 2nd Street.